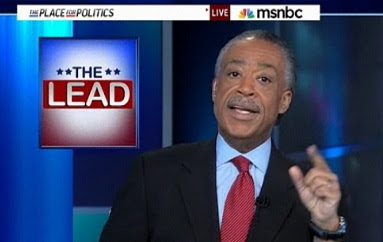 Think On This: Did Al Sharpton Leverage Black Agenda to Get MSNBC Show? Posted By:Unknown | At:1:05 PM Be the first to comment! I don't know if this is a case of 'hateration' or rather plain ol' bewilderment, but the appearance of Al Sharpton as an anchor on MSNBC has been really curious to me. There are plenty of seasoned black journalists who deserved that spot over Al, but yet it was he who got the call. I don't knock the man for his 'hustle' (and when I say hustle, that's exactly what I mean), but something in the milk ain't right and obviously the people over at the Daily Beast agree. They did an entire expose as to how Sharpton's endorsement of the controversial NBC/Comcast merger may have led to him becoming the 6PM anchor on MSNBC. A Comcast spokesperson told The Daily Beast that Comcast has given $140,000 to Sharpton’s National Action Network since 2009—the same year the merger was first proposed. Though MSNBC president Phil Griffin was honored with a top prize at the April 2011 annual conference of NAN—and he, Chris Mathews, and other NBC notables had a table at NAN’s dinner—NBC would not answer questions about how much it's given Sharpton. Comcast also insisted in an email to The Daily Beast that the company “pledged we would not interfere” with NBC news operations, and “we have not and we will not,” a response similar to the only answer we got from NBC. Neither, however, directly answered the question of whether there was any connection between Sharpton’s merger role and his anticipated selection for the show. Now isn't that interesting. People threw salt and shade at Tavis Smiley for pretty much doing the exact same thing when it came to how he leverage the State of the Black Union for his own personal interests. I wonder how these same people feel about brother Al. Will he receive the same criticisms that Tavis received or is this just something that we've come to expect from brother Sharpton?